Parasyte -the maxim- has become one of the top anime on Toonami, and what better way to celebrate its immense success than with an awesome release? 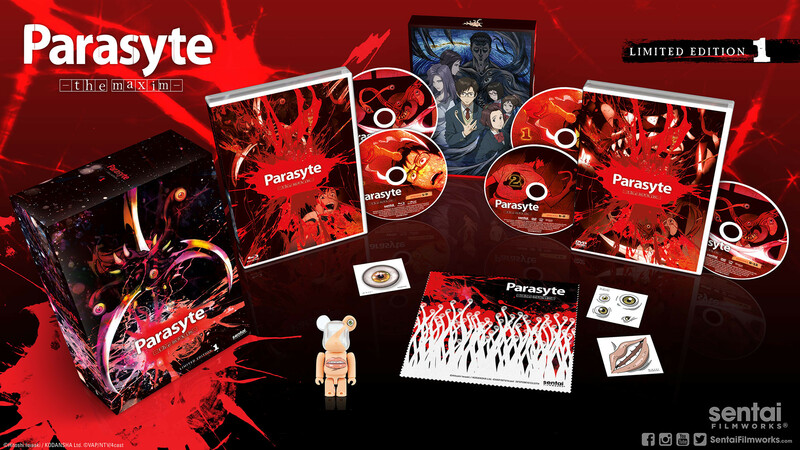 We're very happy to reveal the Parasyte -the maxim- Limited Edition Premium Box Set! We've broken up the contents for you guys to view below. Let's take a look at the first collection box set, and everything that's in it! 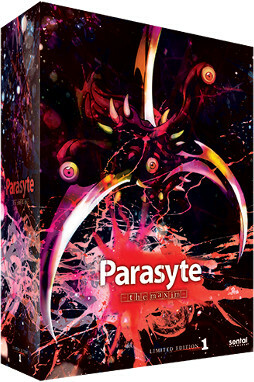 The Parasyte -the maxim- chipboard box is made of sturdy cardboard, that can be used to deflect unwanted pokes, lingering stares and occasionally fleshy shaped knife like appendages. The front and back art is designed to scare away would be predators, should the situation turn from your favor. 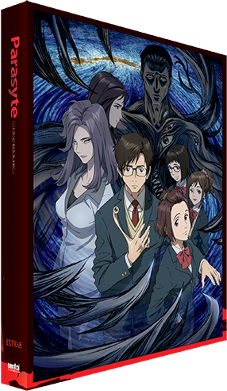 The Parasyte Premium Box Set comes with both a Blu-ray and DVD version of the first 12 episodes of the series, detailing the beginning of the Parasyte invasion on Earth, Shinichi's transformation from unassuming background character to raving badass, and Migi's ascention from flubby bookworm to bonafide wrist rocket. The Extras box contains all the goodies that come along with the premium box set. The artwork may be familiar to many of you, since it's the show's key art (the defining and identifying image that goes along with every title). Inside the Extras box you will find some awesome Migi inspired temporary tattoos so you can brew up your own parasyte in house, and a nifty lense wipe for your glasses in case you get any kind of foreign matter on them, bloody or otherwise. Finally we have one of the most interesting items in the set: the Green-eyed Migi Be@rbrick collectable figure from Medicom Toys. This bad boy is exclusive to the Parasyte Premium Box Set, so heads up all you Be@rbrick collectors out there! There you have it, the Parasyte -the maxim- Limited Edition Premium Box Set! Preorders for the set will be up soon, make sure to follow us on Twitter and Like us on Facebook for additional info and to find out when it will be available!